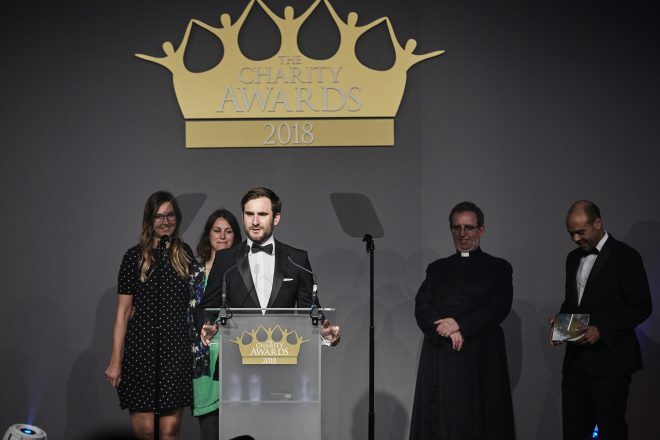 Charity Awards 2018. Photograph by Tabatha Fireman for Civil Society Media. On Thursday 7th June, David (Science & Policy Manager), Jess (Deputy Head of Fundraising & Communications), James (Campaign Officer) and Sally (Marketing & Communications Officer) jumped on the 11.29 train heading east. The excitement was palpable and caffeine levels were high. 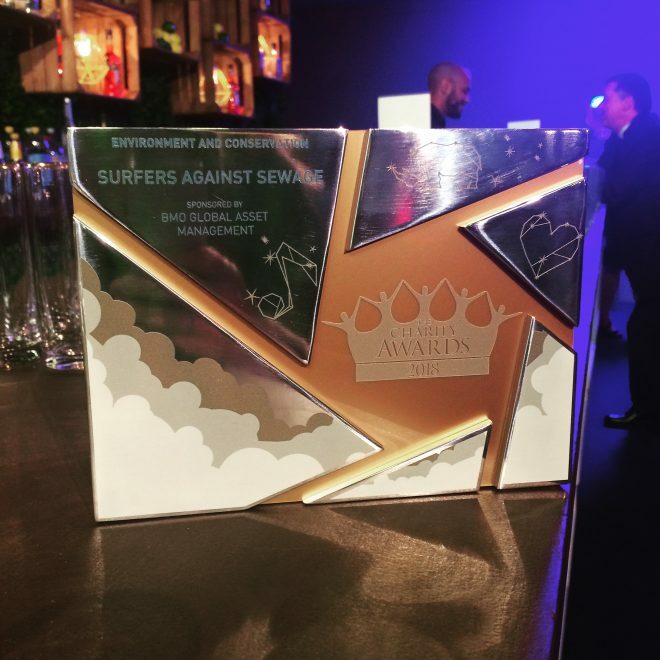 The team were on their way to the Big Smoke for one reason only: to see if Surfers Against Sewage’s Plastic Free Communities campaign would fend off competition for the coveted Charity Award for Environment and Conservation. 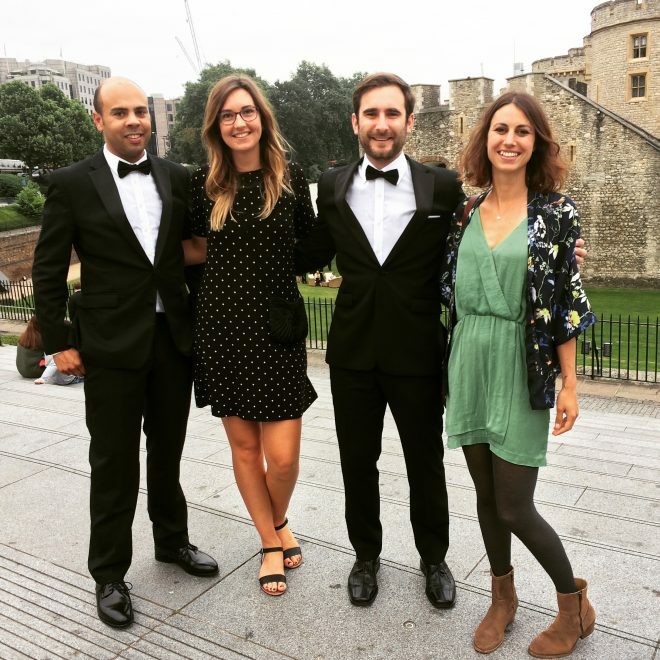 The glamorous evening was held at The Pavillion in the grounds of the Tower of London with red carpet, bubbly and all the trimmings. But in true SAS fashion, we got ready in the nearby public toilets… You can take the surfer out of Cornwall and all that! The night got off to a great start with a very humorous welcome from Reverend Richard Coles (of Strictly fame) and some joyful ditties from the on-stage pianist. As each winner was announced for the various categories, an inspiring short film about each charity was played to the audience while the representatives winged their way through the tables and up to the stage. It was a chance to find out about all of the incredible things that charities are achieving up and down the country and the lives that are being changed following a few rocky years for the charity sector. It made us all very proud to be a part of a network of humans that care immensely about the environment, people and animals. And finally, the moment we had all been waiting for. Fellow Strictly contestant and Olympic swimmer Mark Foster took to the stage to present the award for Environment and Conservation. It was a tense moment waiting to hear whether we had to do our pre-practiced Oscar-loser-faces or celebratory hugs. Hugs all round! Team SAS made their way up to the stage for even more hugs with Mark Foster and the award sponsors, and David thanked everyone involved. 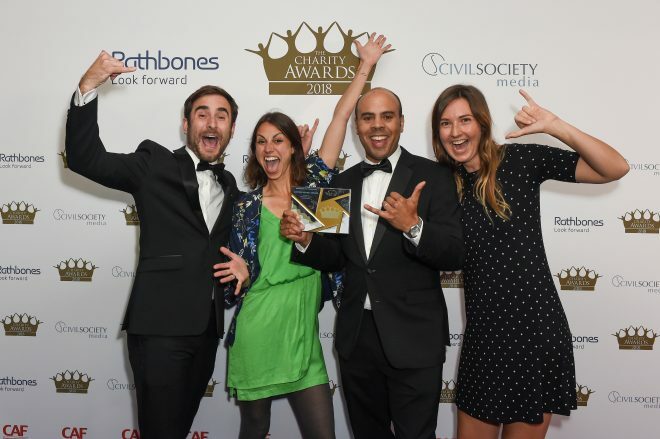 After a few more awards and a heart warming, tear-inducing speech from the overall Charity Award winners Who Cares Scotland, it was time for the sleeper train back to Cornwall and back to work for World Oceans Day! We’d love to take the credit for this award, but in all honesty it was you guys. The work that you’ve put in to becoming Plastic Free Communities is admirable. Despite being full time workers/mums/dads, you have found the time to bring together your community to do something truly amazing and change your area’s relationship with avoidable single-use plastics. All we did was give you the tools. Since the project’s launch last year, there are now 300 communities working towards Plastic Free Status. That means 25 million of the UK population are now living in an area taking a stand on single-use plastic. Our amazing Community Leaders have worked with 5,840 community groups, 8,760 businesses and hosted 1,752 events. Thank you does not cover it! We’d also like to give a huge high five to our fellow shortlisters Borough Market for all of the work they’re doing to go plastic-free. We were very proud to share the bill with you. If you feel inspired to join this incredible people movement and lead your community, head to our Plastic Free Communities hub. « WE ARE RECRUITING – SAS Beach Clean and Project Coordinator!